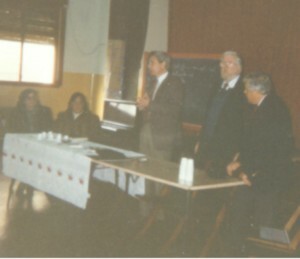 ESL Conference Presentations by William Eubank - "The Rotary InterDistrict Teacher Exchange - U.S./Argentina 1997"
"The Rotary InterDistrict Teacher Exchange - U.S./Argentina 1997"
You can learn more about the Rotary InterDistrict Teacher Exchange Program through this link. In 1997, more than 100 teachers from six countries will be involved in exchange programs in the U.S., Mexico, Central and South America. It could be the greatest summer you have spent teaching! Starting in 1996 Rotary International District 4890 Clubs of Buenos Aires, Argentina have sponsored teachers from Argentine schools as teachers of Spanish in the U.S.A. through the R.I.T.E. program. Argentine teachers have been placed in Abaline and Fort Worth, Texas for four week sessions to teach practical Spanish to North Americans who would benefit from a working knowledge of Spanish. At the same time, the Argentine teachers learned some practical English. They also learned about culture, customs, history, and geography in the U.S.
Plans are being made now to place teachers again during January 1997 in several different states in the U.S. Rotary Clubs in the U.S. expressing interest for next year include Fort Worth (Tx. ), Abaline (Tx.) and Kansas City (Mo.). Other locations are being developed. In general, Argentine Rotary Clubs pay for the teacher's round trip transportation. The U.S. Rotary Club provides room, board and local transportation for the teachers. You do not need to speak English to be included in this program. The teachers are all volunteers and there is no charge for the students to take the course. The teachers provide the teaching materials. Classes are generally taught to adults and can be set up according to size, type of student and/or existing language ability. In previous years classes have targeted workers in government service positions (policemen and firemen), teachers, service (telephone operators and medical),business persons and professionals.